I review Gmelius, my #1 Gmail add-on for 2019. Check out how the platform performs for email automation and more. Emails. We all use them to communicate. And most of us dread unorganized, never-ending email inboxes. Over time, our inboxes keep getting cluttered, and there is no way to keep our emails organized. They just keep pouring in. We also don’t have a lot of smart features to schedule, sequence or save email templates. Which is why I decided to check out Gmelius, an email automation and shared inbox tool for Gmail. 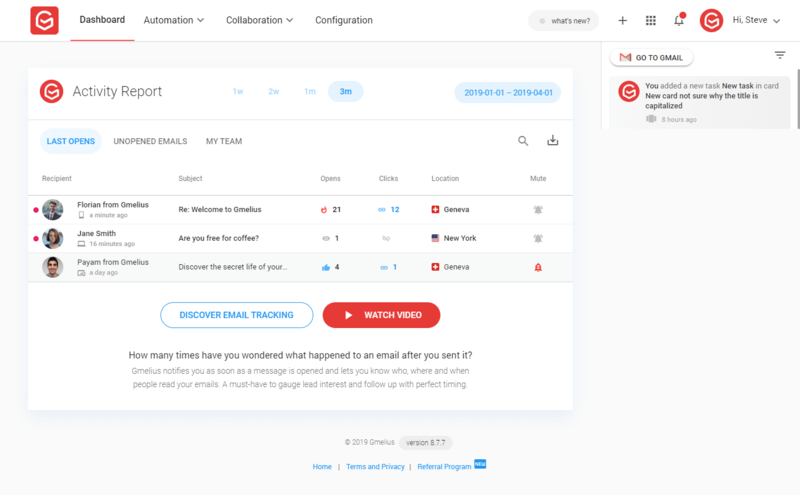 Gmelius ranks #1 on my list of the best Gmail add-ons for 2019, so it was only right that I took a closer look at all that it has to offer. “Gmelius is extremely easy to use as it seamlessly integrates with Gmail inbox, providing an almost zero learning curve. Accomplishing a user-friendly interface, native to Gmail is a challenge in technical development. Our unique blend of automation and collaboration features combine external and internal communications, making it unnecessary to switch between multiple solutions. In addition, Gmelius’ mobile apps erase the restrictions of time and space, while embracing ultra-efficiency and working on the go. Getting started with Gmelius was effortless. Simply install the Gmail add-on from the browser extensions directory, authorize it with your email and that’s it. That is all it takes to get started with Gmelius. On your first login you’re greeted with a very helpful guided tour which explains how you can use different components of the extension right within Gmail. The first thing you’ll notice is the red Gmelius logo on the right-hand pane in the apps section. Clicking on the logo opens up an entirely new spectrum on how to actually deal with your emails. Gmelius goes good to great the moment you open the email composition dialog box. Suddenly, you’ll note these extra bunch of options other than the usual formatting features of Gmail. The extension integrates with Gmail so seamlessly as if it were built natively by Google itself. Gmelius also comes with a sleek dashboard letting you create automation, run the reporting and more. Overall, the design is well thought-out with great use of Material Design. Gmelius designs every feature in a user-centered way. With our users as a starting point, we strive to deliver an enriching experience, while solving pain points and minimizing confusion. Good design is an every-day challenge at Gmelius, and we have an excellent team in place dedicated to our users. With Gmelius, you get everything you need to better manage your email inbox. There is email tracking that allows you to track email opens and link clicks, you have email sequences to create conditional sequential emails that are sent out automatically, saving you time and effort. There is also a shared inbox so you can easily share your email inbox with your team members. Let’s review Gmelius’s features one by one. The Gmelius Dashboard is your central control room for all your settings in Gmelius. Using this dashboard, you can create email templates, sequences, campaigns, etc. and later use them through your email composer in Gmail. Through the Gmelius Dashboard, you can also manage your team, measure billing and monitor other administrative settings. With Gmelius, your email inbox is supercharged with features, but it’s astonishing how subtle the changes in the layout are. It almost feels like a stock add-on from Google. 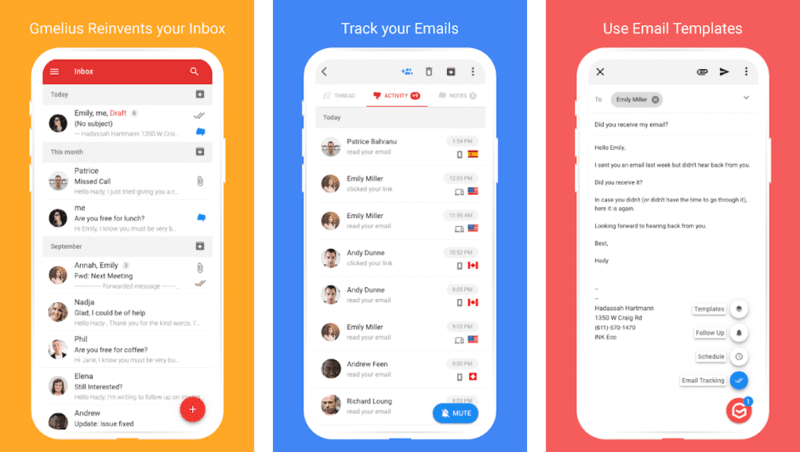 Gmelius has done a great job in keeping the stock look and feel of your Gmail inbox the same all the while adding tons of useful features to it. Not a lot that has changed, right? A Gmelius icon appears in the app navigation panel on the right. When you hover over your email items, a couple of more icons are added to the options tray. Also notice the Boards page added to the inbox panel on the left. Subtle and amazing. I am really impressed. Notice the new icons added to the bottom toolbar? Let’s see what they are all about. It is common to receive read receipts via standard email inboxes. However, who has clicked on the links that you send out, how many people have opened your email from a batch/group, and the ability to enable/disable tracking with one toggle is not found in standard email inboxes. You get these tools in specialized email marketing platforms. Having these features in my Gmail inbox was a delight. Next up – email scheduling. There are times when we would like to schedule emails. You might be a freelancer working with an offshore client and you’d like to send out a timely order delivery. Or you might just need to email someone at a particular time of the day at which you might not have internet connectivity available. Whatever the case, email scheduling with Gmelius can help you out. Simply write down your email, and press the Send later button to time your email as you see fit. Gmelius will take care of sending the email at the right time for you. This can also help people who usually have to write and respond to a number of emails each day. You might not get the time to do so during business hours, which leaves you to send out untimely emails. With scheduling, you can just type down all your emails and responses when you get the time and schedule them for later at a convenient time. Long email threads can get difficult to monitor. It often happens that you don’t hear back from the other person on an email you sent. Gmelius solves this problem with the help of email follow-ups. With follow-up reminders, Gmelius will bring all emails back to your inbox if you have not received a reply. This helps with timely follow-ups and enables you to better convert prospects to customers. Another great feature that comes with Gmelius is the Kanban boards that it allows you to create inside of your Gmail inbox. With these boards, you can easily organize your emails in a Kanban style, add tasks, notes and keep work organized. Your Kanban boards in Gmelius are made of cards. These cards can contain emails, tasks and notes. If you’d like to keep separate Kanban boards for emails and tasks, you can do so by creating individual Kanban boards. You can also share your Kanban boards with your Gmelius team members if you’d like to collaborate. Couple of pointers for the Gmelius team here – the card title has a text-transform property set to Capitalize. This might not be the best approach for card titles, as I don’t like my titles capitalized unnecessarily. Another thing is that you cannot edit any created tasks. If you’d like to edit a task, you will have to delete it and create a new one. Also, there is no drag-and-drop functionality for tasks in Gmelius. Your list follows a FIFO model, meaning the task you first entered stays on top of the list (and is intended to be ticked off first). Tasks ticked off do not move to the bottom of the list either, they stay where they are. Tasks in Gmelius also don’t have any functionality, such as reminders or repeat settings. They are basically checklist items that you can mark off your list as you go through your day. Let’s talk about security features for a bit. To prove the existence and integrity of any emails you send, Gmelius leverages blockchain. With email stamping, any emails you send have their associated encrypted data anchored into the Ethereum blockchain. This is an important feature where key, classified and official communication is being sent out via the email channel. Using this anchored data, you can then prove the identity and integrity of your email at any time. Often at times, organizations and people send out emails using different trackers to measure and monitor how often your read and engage with their emails. Using Tracker Detection in Gmelius, you can detect and block out any such trackers associated with the emails you receive. To activate tracker detection, head over to your Gmelius Dashboard and click on Configuration from the header. Under Privacy and Security, click on the toggle for Detect and block email trackers. What is better than emails with emojis? Emails with animated GIFs. With Gmelius, you can also add GIF images to make your emails more personal and interesting. I loved using them in my emails during the time that I tested out Gmelius. They were easy to add, and I could easily search through the GIF library to find the one I wanted. To take over monotonous email jobs, Gmelius has introduced a bunch of email automation features that you can leverage. You get templates, email sequences, campaigns, recurring emails and more, each catering to a specific set of requirements. 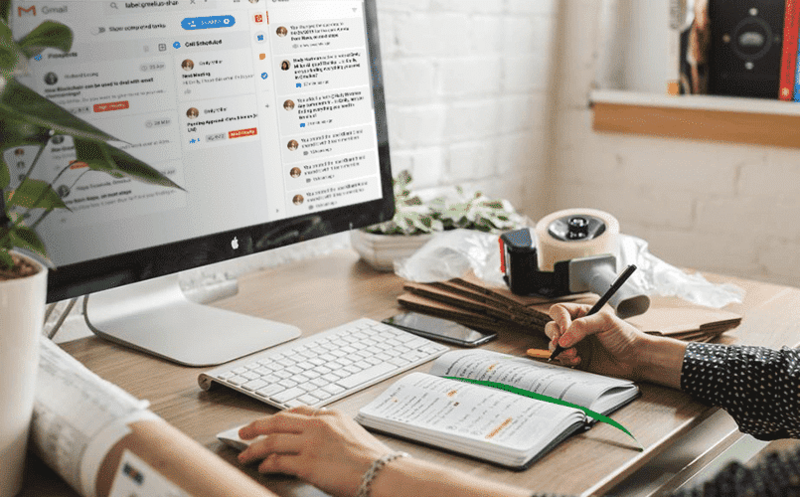 The best use cases for email templates are with the customer support team, as they often roll out pre-defined, structured email replies to certain incoming inquiries. 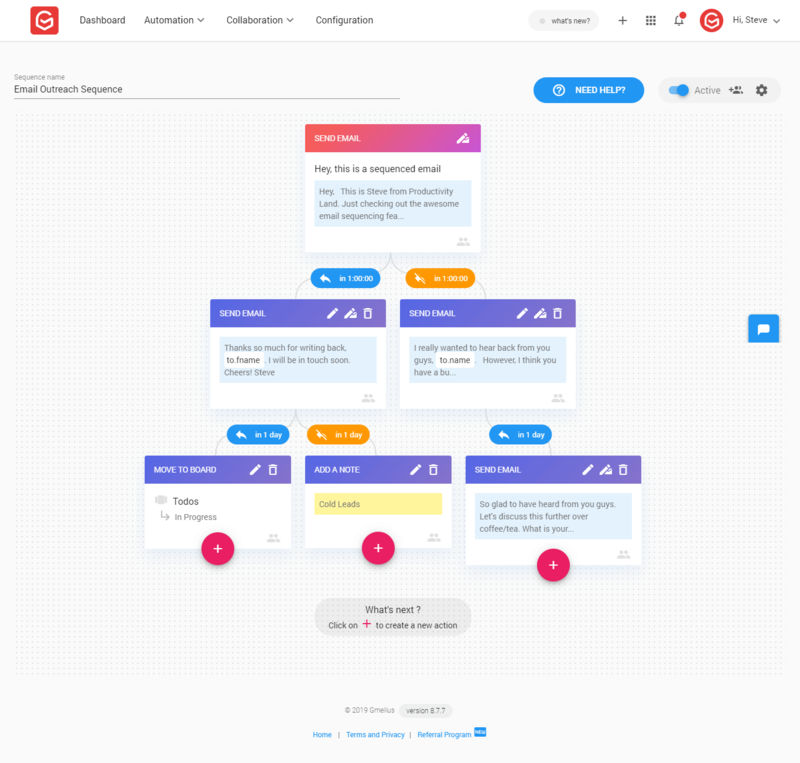 Templates save you a lot of time and make one-click responses possible, improving the team’s ticket resolution times and ensuring a quality customer support experience. There are certain templates that come with Gmelius out of the box, and you can create more if you’d like. To create an email template, head over to your Gmelius Dashboard and click on Templates from the Automation dropdown. To use a saved email template, open the email composer and click on Insert template/sequence. You can also share email templates with your team members so everyone uses a standardized reply for certain emails and messages. I enjoyed creating email sequences in Gmelius, and they have great value to offer for email marketers. While email follow-up reminders were a great introduction, Gmelius further eases your job of following up by creating easy-to-use email sequences. Through these sequences, you can automate your follow-ups or responses and ensure a timely course of action. To create one, head over to your Gmelius Dashboard. 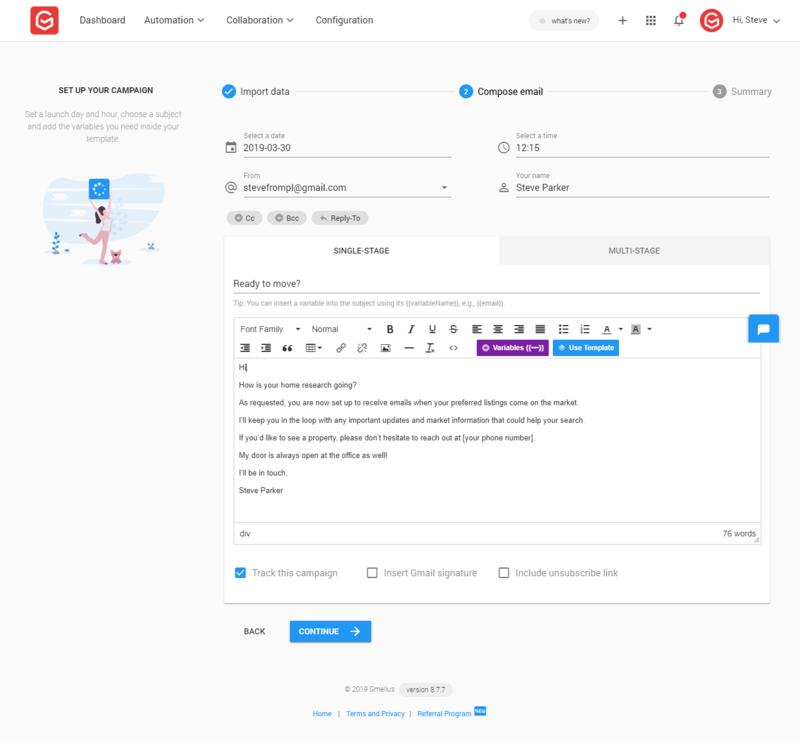 You can also share the email sequences you create with your team members so everyone uses the same standardized workflow for certain emails and messages. If you have to send out an email after a set period of time, such as a reminder or an email notification, you can use the recurring email feature in Gmelius to automate this process. To create a recurring email, simply head over to your email composer in Gmail, and click on the Clock icon next to the Send button. Then, click on Set recurring email. Start & end date: Choose the tenure for which the recurring sequence will remain active. You can also let the recurrence run indefinitely. Weekdays only: Lastly, you can choose to deliver your messages only on weekdays if you so choose. Any messages that were going out on a weekend according to the recurrence schedule will now be postponed to the following Monday. You can create an email campaign using the Gmelius Dashboard, or the email composer. To create a campaign, just head over to the Templates section. You will be asked to upload a CSV file for the emails that you’d like to send your campaign out to. Then, compose your email. Here, you will be asked what day and time you’d like your campaign to be scheduled for, the email content, and some other nifty settings for email signatures, email tracking and more. Next you will be shown a summary of the campaign you just created. Done. Your email is ready to be sent out to all the email addresses that you provided. You can also set up multi-stage campaigns to send out more than one email. With Gmelius, you can also use BCC and CC rules to keep a team member/subordinate/supervisor always in the loop. You can also use this feature to create a new lead in your favorite CRM software each time you send out or reply to an email. No more forgetting to add someone in the loop and then later sending another email to everyone. You can find email BCC and CC rules in your Gmelius Dashboard under the Automation dropdown. This is also a good workaround if you are using Gmelius with your CRM tool as there are no integrations available with Gmelius at present. We have talked about how Gmelius helps you track emails, organize them, secure them as well as automate monotonous email jobs. Let’s talk about team collaboration and sharing in Gmelius. The first online team collaboration feature that comes with Gmelius is Shared Inbox. To create email groups such as [email protected] or [email protected], you can create a shared inbox. Any emails you send to the group email will be sent out to all the members in the group. The next benefit of having a shared inbox is email assignment. Any incoming lead, ticket or inquiry can be assigned to a team member who is part of the shared inbox. No need to forward them the email, simply assign work directly through your shared inbox with Gmelius. To create a shared inbox in Gmelius, head over to the Gmelius Dashboard, and click on Shared Inbox under the Collaboration dropdown. Another collaboration feature introduced by Gmelius is Shared Labels. This lets you create and share your labels in Gmail to streamline conversations and messages. Simply assign a shared label to an email so it is visible and organized for all your team members. You can create shared labels for different clients, according to priority levels, or the team that might need to address a specific email. For team management, head over to Manage My Team under Collaboration from your Gmelius Dashboard. Here, you can add or remove members from your team on Gmelius. For other configurations, simply click on Configuration. There are various settings you can control from here, such as tracker detection, Kanban boards, GIFs, email markdown support and more. Gmelius is available on both Android and iOS. The Android app is in development at present and has an Unreleased listing on the Google Play Store, however, the iOS app is available for use. I did find some strong comments made on the iOS app for Gmelius. Gmelius also offers a 30-day refund policy for all its paid plans. Gmelius is an official Google Cloud partner and uses Google Cloud Platform (“GCP”) to persistently store user data meaning we do not store data on our premises. The content from emails is not stored in our databases, only metadata. Gmelius has a dedicated support portal for its customers to submit any tickets or queries which are responded to in a timely manner. Below are a few support options available. Live Chat: Gmelius has a very active live chat support available which is always on its toes to help you get started or resolve any issues. Social Media Support: Gmelius entertains social media support on Twitter and Facebook along with help tutorials and products information also available on their official blog. For complete email management and automation, you can safely bet on Gmelius. It gives you analytics and insights, allows you to send out campaigns, create sequences, recurrences, templates and much more. Although only a Gmail add-on, the tool lets you enjoy a host of powerful features that supercharge your email inbox. Bonus points for the design team at Gmelius for making the integration with Gmail so subtle. Everything is there without taking away the stock look and feel of my Gmail inbox, which is great.